Rover ants were first discovered in the United States during the 1970’s. Not native to the United States, these ants are believed to originate from Argentina. Rover ants have proven to be a pest that is difficult for consumers to control report pest control companies in Houston . Often mistaken for little black ants because of their similar look and size, rover ant infestations have several different characteristics. Unlike little black ants that create a nesting site that is usually easy to locate, rover ants can travel a great distance from their nesting area and can be located in a wide variety of places. Outside you will find rover ants living in mulched planters, gutters, up trees, under pavement, under stones, and in rotting wood. Inside, rover ant infestations tend to be found in bathroom and kitchen areas especially where water damage has occurred. To the naked eye, rover ants appear to look like little black ants as they are dark in color and about 1/16 of an inch long, just as a little black ant is. It takes a microscope to realize that rover ants only possess one node between their thorax and their abdomen instead of the two nodes that the little black ants have. Like some other ant species, rover ants produce winged reproductives that set out to develop a new colony. 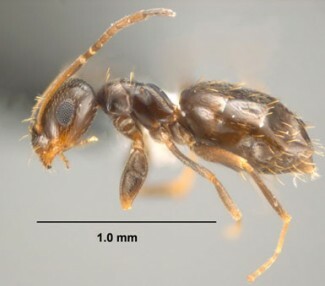 Just like with other ant species, reproductive are larger than worker ants. There is only one queen rover ant in each colony, but many colonies are able to co-exist in close proximity which is one of the reasons why this species of ant is so difficult to control report Houston pest control professionals. Many Texas residents find that rover ants initially respond well to initial treatment, but they are quick to re-infest a building or surrounding property. Because of their ability to infest a property with ease and speed, it is important to nip rover ant infestations in the bud as soon as they appear. A pest control company in Houston like Protex Pest Control will be able to properly identify rover ant populations so that proper eradication can occur.